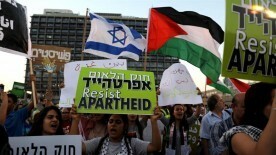 Passed last month, the new state-nation law officially affirms Israel's Jewish character, but critics say it turns non-Jewish citizens of the country into second-class citizens, further marginalising some 1.8 million Palestinians with Israeli citizenship and other minorities. In a survey released by the Pew Research Center, about half of Israeli Jews (48%) said that "Arabs should be transferred or expelled from Israel." 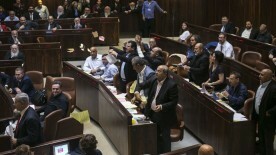 Palestinian citizens of Israel, including two members of Israel's parliament (Knesset), respond. Israel has ordered a six-month closure of Palestine 48, a new Palestinian television channel funded by the Palestinian Authority and catering to Palestinian citizens of Israel. "I will not allow for Israel's sovereignty to be harmed or for the Palestinian Authority to gain a foothold in Israeli territory," said Public Security Minister Gilad Erdan. 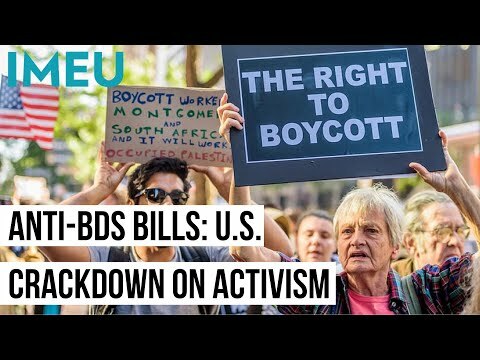 Since the Oslo Agreement, settler politicians have brought their hateful rhetoric and open violence against Palestinians back across the green line with calls for exiling the remaining Palestinian minority in Israel. 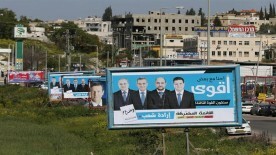 Rightist Zionist parties have incorporated exile planks into their election platforms. Ahead of Election Day in Israel, the IMEU offers a Q&A with Dr. Ahmad Tibi, longtime leader of the Ta’al party and candidate for the Joint List, a coalition of parties comprised mainly of Palestinian citizens of Israel which, according to polls, may win the third most seats in Tuesday’s vote and could even become the official opposition in the next parliamentary session. 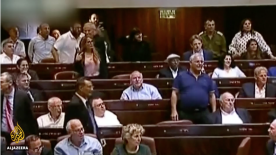 Israeli Election 2015: Who Is Represented? Who Is Disenfranchised? 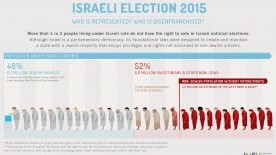 On March 17, Israelis will go to the polls to choose a new government but more than one third of people living under Israeli rule do not have the right to vote. Although Israel is nominally a parliamentary democracy, over the course of the country's nearly 67-year history there has been a period of only about one year that Israel did not rule over large numbers of Palestinians by military decree.